Both groups are members of the reptiles and have scales, lay eggs, and are ectothermic (“cold-blooded”). 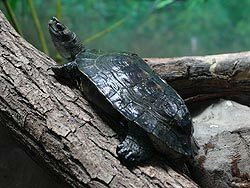 Turtles live in water (oceans, brackish and fresh water). 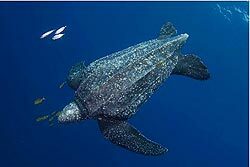 Sea turtles rarely leave the water except for when females come on land to lay eggs. Other turtles live in fresh water, like ponds and lakes. They swim, but they also climb out onto banks, logs, or rocks to bask in the sun. In cold weather, they may burrow into the mud, where they go into torpor (being dormant or inactive) until spring brings warm weather again. Tortoises may be found in arid areas and only enter water to drink or clean themselves. 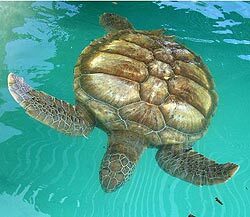 Turtles have webbed feet or flipper-like fins to make swimming easier. 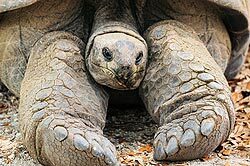 Tortoises have feet without webbing, often with sharp claws for digging. Turtles tend to have flatter, more streamlined shells than tortoises, while tortoises have a more domed shell. Tortoises are typically larger, bulkier and heavier than turtles. Turtles are omnivores or carnivores whilst tortoises eat only plants and leaves and other vegetation, so they are herbivorous, especially preferring moisture-bearing vegetation. In Australia only sea turtles are called turtles – everything else is called a tortoise. Tortoise - note the clawed feet. an adaptation to life in water.